More than anything else Jesus wants everyone to be in a relationship with him. In these chapters there is a sense of urgency and a call to those who are lost. God does not want even one person to miss out on being in relationship with him, he rejoices over every single person who repents and comes to him. There are many people who live good lives, doing nothing illegal, living morally well and giving to others and yet they are still lost. There is a false reassurance that they will enter heaven because they are basically good, what could God have against them. Jesus talks about the narrow door (13:22-30), you may think the door to God is a huge opening that a good life takes you through, but without a relationship with God, that door will be closed. God does not want to shut anyone out and Jesus pleads on your behalf for more time. In the parable of the fig tree (13:6-9) the caretaker of the vineyard pleads for the life of a tree that has borne no fruit, asking for another year he commits to tend it, fertilise and look after it to encourage it to grow. Are you a caretaker, is there someone in your life that you need to spend more time with to show them God's love? Or is Jesus pleading on your behalf, asking the Father for more time for you to come to him? God does not want anyone to perish, he wants you in relationship with him, but one day the door will be closed. You may think you are not worthy to be called a child of God, the good news is none of us are and we all are. Jesus died to make you worthy to be called a son or daughter of God and he wants to bring you into a relationship. The lost son (15:11-32) is the most wonderful illustration of God's love and acceptance to all, whatever your past or the worth you feel. When you come before God he does not see what you have done, he does not judge your worth or condemn your failures. 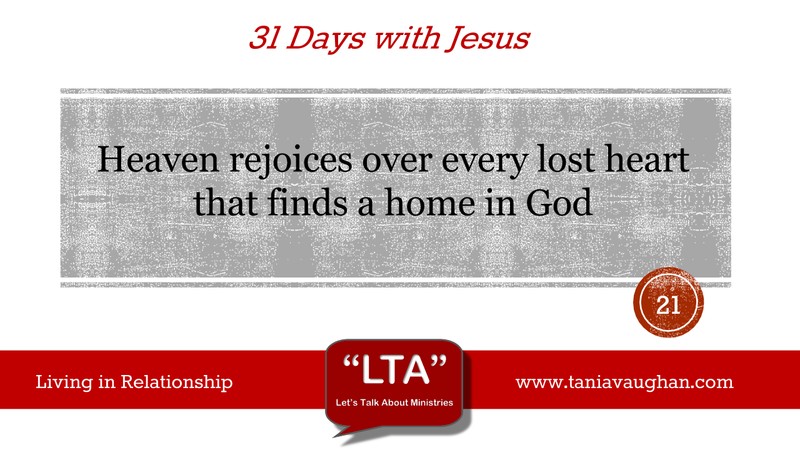 God sees a person who is lost and he rejoices that he has found you. I am currently reading the 'Left behind' series of books and I can understand Jesus' sense of urgency, time is infinite with God but you need to be in relationship with him to experience the knowledge of eternity. You are invited into eternity and you are welcomed, God sees you as the child he loves. One day the door will close, which side of it will you stand? Lord, thank you for waiting for me and for welcoming me. I have been lost for so long, wandering aimlessly in life and I can sense the urgency in coming to you. Thank you that you do not see what I see or judge me for what I have done in my life. Lord, as I look to you I see reflected in your eyes the lost child finally home. I repent and give myself into your loving arms. One of the things that helped me commit my life to Christ and finally become a Christian was a conversation i had whilst at Uni, with a friend of mine after I walked her home (rough neighborhood!). She said "the only difference between a good man and a good Christian is that the good man does not know Jesus" the point is without that amazing relationship with JC we can bang on the doors to heaven all we like and they will not open; it will be futile to shout to God "I helped at the Scout group or I chair the 'save the historic lamppost society' if we do not have a relationship with Jesus. We all fall short of the glory of God and continue to sin, yes some more than others but we all sin - the wonderful thing about the crucifixion is grace - Jesus died for our sins so we can have a route back to God. A wise man once told me when I first announced I was a Christian 'there are plenty more Good men than Good Christians' and he is probably right but unless they know Jesus as their personal Lord and Saviour their name will not be down and they will not be getting in... I think the roll call at the end times will surprise many who thought they had a get into heaven free pass.